Denver VA Medical Center, when completed, will be one of VA's most sustainable medical centers. The U.S. Department of Veterans Affairs' (VA) Sustainable Design Program serves to support and encourage, the integration of sustainability into VA's design and construction programs. The Program achieves this through its Sustainable Design Manual, several master construction specification sections, participation in VA's design review program, and active involvement in the development of VA's design and construction standards. VA's focus on sustainable facility design and construction took hold in 2006 when VA became one of the original signatories of the Federal Leadership in High Performance and Sustainable Buildings Memorandum of Understanding. Since then, VA's Sustainable Design Program has helped to bring VA to the forefront of sustainable healthcare facility design, enabling VA to receive much recognition and numerous high-level awards for its efforts. Sustainable: VA's Sustainable Design Program addresses many facets of sustainable facility design, including energy efficiency, water use reduction, occupant health, sustainable materials, environmental impacts, transportation, and more. 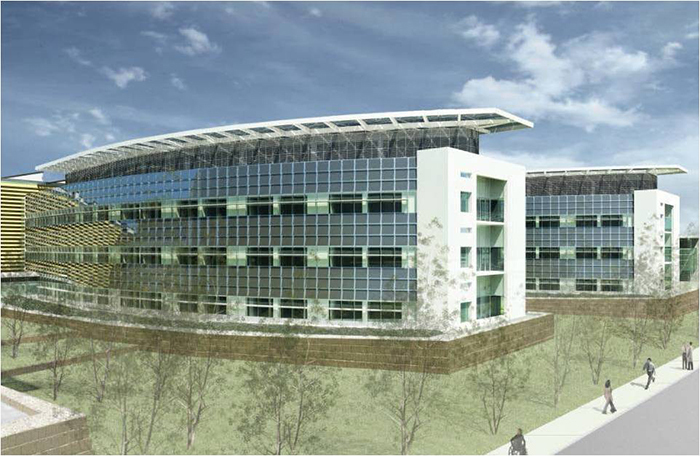 This Whole Building Design Objective makes up the core of VA's Sustainable Design Program. Historic Preservation: VA manages 1,700 historic properties, making it prudent for VA to place a heavy emphasis on harmonizing its sustainable design goals with its historic preservation goals. As part of this effort, Historic Preservation specialists from VA's Office of Construction & Facilities Management assisted in the development of VA's Sustainable Design Manual and regularly provide input into high-level decisions that might affect VA's historic properties. The success of these efforts can be seen in the numerous awards VA recently received for a renovation project undertaken at a historic property in West Los Angeles, California. The project won a total of eight awards in the areas of both sustainability and historic preservation. Cost-effective: Cost-effectiveness is a recurring theme throughout VA's sustainable design policies and standards. VA requires lifecycle cost analysis for nearly all project types and sizes, as well as lifecycle cost-effectiveness for most sustainable design-related aspects of a project. Productive: VA's Sustainable Design Manual encourages design aspects known to enhance employee productivity. These include daylighting, advanced filtration, increased ventilation, occupant-controlled lighting, glare reduction, non-toxic materials, and more. Numerous studies indicate that these same design aspects also help to improve patient outcomes in healthcare environments, further reinforcing the benefits of sustainable design. 24% of VA's hospitals are currently ENERGY STAR-certified. While VA hospitals represent only 3% of the nation's hospitals, they represent 16% of all ENERGY STAR-certified hospitals. In 2015, 24.5% of VA's electricity came from renewable sources. VA currently consumes 30.2% less water per year than in 2007. Since 2008, VA has reduced its Scope 1 & 2 Greenhouse Gas Emissions by 16.3%. Honoring veterans and protecting resources with a low-water landscape design at Fort Bliss National Cemetery. Because VA operates the nation's largest healthcare system, it is in a unique position to be a leader in all aspects of healthcare delivery. This leadership is enhanced by the fact that all of VA's design and construction standards are publically available online via VA's Technical Information Library. On numerous occasions, VA has been notified that other healthcare systems throughout the nation, and even the world, refer to VA's standards regularly. This means that sustainable design actions taken by VA can have a tremendous impact on the entire healthcare industry. VA's Sustainable Design Program can easily be replicated by other healthcare systems. In fact, many healthcare systems already refer to VA's design standards when establishing their own policies and standards. Because VA's design standards are publically available via the worldwide web, the Program's reach extends throughout the world. The central focus of VA's Sustainable Design Program is to promote energy cost savings, water use reduction, and the use of renewable resources. To that end, VA was recently recognized by the White House for its medical centers using 35% less energy than average U.S. hospitals. In addition, VA's Sustainable Design Manual requires a minimum of 10% of electrical power in new hospitals come from renewable sources, if cost effective. This surpasses the Energy Independence and Security Act requirement of 3.75% onsite renewable energy. VA requires that all renewable energy technologies be cost-effective, ensuring these investments will pay for themselves over their intended lifecycle. If renewable energy is not cost-effective, VA has a "renewable ready" requirement to allow future installation of renewables without requiring major structural renovations. VA Sustainable Design Manual provides design criteria for all VA-owned facilities. The VA Sustainable Design Manual includes a section on Climate Resilience and encourages project design teams to coordinate project resilience activities with local and regional authorities. In addition, VA's Sustainable Design Program Manager was selected to represent VA on the White House's Climate Resilience Working Group, established in 2014. Reduce facility energy intensity by 2.5% annually through FY 2025. Reduce potable water use by 2% annually through FY 2025. 10% of electrical energy from renewable sources. Reduce Scope 1 & 2 Greenhouse Gas Emissions by 24% by 2025. Divert 50% of non-hazardous construction & demolition debris away from landfills. VA achieves numerous synergies through its Sustainable Design Program. This included finding creative solutions to meet historic preservation requirements, improving employee productivity, and improving patient outcomes through use of sustainable materials and daylighting. The overall goals achieved by VA are calculated and/or measured annually for submission with VA's Strategic Sustainability Performance Plan. The most significant benefit of VA's Sustainable Design Program is in cost reductions. By reducing expenditures on resources such as energy and water, VA is able to spend more on Veteran care. White House Fact Sheet, GreenGov Presidential Awards, September 2016. U.S. Department of Agriculture "Biobased Success Story", 2014.